When looking for a comfortable shoe to fit swollen feet, it’s not just the width that’s important – it’s also the depth. Cosyfeet has an extensive collection of extra deep shoes ranging from dressy heels to waterproof walking boots. One of our deepest shoes is a style called Alison. 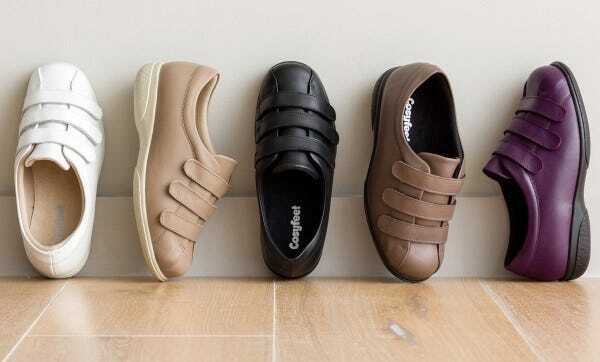 Crafted from beautifully soft leather, this ultra-adjustable casual shoe fits a variety of tricky feet. Made on our deepest last, it’s very generous across the front so it’s ideal if you need extra room for bunions or problem toes. It also opens right out, so it’s easy to put on, even if you’re bandaged or very swollen across your foot. The underfoot cushioning and seam-free lining makes it bliss for sensitive feet. Alison also benefits from a removable comfort footbed which is great if you need to insert your own orthotic. The seam-free, sanitised lining allows your feet to breathe and is ideal if you have diabetes or sensitive feet. Alison is available in a range of colours including Black, Plum, Mink, Taupe and White.